Terry: What's in Your Mouth? 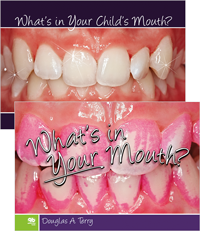 What's in Your Child's Mouth? What's in Your Mouth? What's in Your Child's Mouth? Health care providers have a responsibility to instill each new generation of patients with the importance of oral health care, and this book teaches pediatric patients and their parents the importance of proper brushing and flossing by showing what happens when children neglect their teeth. This hardcover book is two books in one. The first half (What's in Your Mouth?) is written to introduce children to the importance of daily hygiene care, and the second half (What's in Your Child's Mouth?) provides parents with the information to guide their children's oral health habits. This book is sure to enthrall and inform patients of any age. Bobby is about to lose his first baby tooth, and he can hardly wait to leave it for Max the Tooth Mouse. But before the wobbly tooth actually falls out, Bobby's parents announce that the family is moving from South Africa to Canada! Will Max be able to find Bobby's tooth all the way in Canada? Learn what happens when Max goes to Canada and comes face to face with Fia, the Tooth Fairy. This charming story entertains as it teaches children the importance of brushing at least twice a day.